Bought this as a study stone but turned out pretty enough to be set. 5.09 carats Malaya Garnet. JrJ, ZestfullyBling, Gloria27 and 13 others like this. In real life it surely doesn't look translucent or opaque- ish at all. Just sleepy and a true red, not light pink at all. Edited- all my photos (except the one mentioned above) come out slightly more saturated or slightly less saturated and I can't capture the true tone of when it looks the best - than what I see in real life. This is tourmaline from Multicolour. It was classified as Light Orangy Pink. Please forgive my terrible photos. Ultimately, I am fairly happy with how it looks. I have yet to see in direct sunlight (thanks weather) but the daylight photos are indeed a peachy color which is what I saw in the picture (though I don't see as much pink as is in the vendor pic and was in the description). In the indoor pics, it does take more of a brownish orange tone but honestly, it's not a bad color either. It was a relatively inexpensive purchase and I am pretty happy. Hopefully this helps someone else! JrJ, ZestfullyBling, MissSarah and 8 others like this. Spess Garnet from Dan Stair, 1.75ct. Very Pretty in real life. That is the most amazing spess!! i have got to get me one of these!! MissSarah, 2Neezers and suzanne2 like this. I thought, I post here my eBay find from caratsgems, a blue zircon. According to the picture I was expecting more greenish blue, but I’m really happy with it. GeauxGirl, ZestfullyBling, MissSarah and 6 others like this. It is lovely. I remember the deal you got on it. GeauxGirl, ZestfullyBling, Gloria27 and 14 others like this. Gorgeous gorgeous gem! There was a thread recently about the perfect color for a padparadscha and yours fell into my absolute favorite hue. Jupiter's pics are spot on. Congratulations! Absolutely gorgeous! When are you going to set this gem? Pretty soon, I hope. This will be my first colored stone project and I want to get it right, but I also want to enjoy the whole process. Right now, I'm spending LOTS of time daydreaming about the possibilities--Is that wrong???? Mmm daydreaming . Not at all! This one deserves a lot of thought! I daydream all of the time. In my car, standing at the coffee pot, doing laundry...it's what keeps me sane. I'm daydreaming right now, setting my stones in a necklace...which ones do I use? Your stone is absolutely gorgeous. Are you going to start a thread on it? Yes, I'll probably start a thread when I'm a little closer to being ready to set it. Home and work are hectic right now, but I'm super excited about this project. suzanne2 and Acinom like this. Colored Gemstone Nut, GeauxGirl, Acinom and 13 others like this. lovedogs and suzanne2 like this. Thank you! Made an account the other day just to post this lol. I really can't stop staring at it. The pictures on their website are pretty accurate - the stone itself is just slightly darker in person, but honestly I like it even more and the color is so intense and captivating. Highly recommend Andrew and Laura at Gemfix. Can't wait to have it set for my girlfriend's surprise e-ring! GeauxGirl, suzanne2, MrsKMB and 1 other person like this. What an amazing stone!!! I love it even more in your photo. It’s such a vibrant and intense colour. Do you have a setting in mind? And who will set it for you? The page took a minute to load and I'm looking around for your pic, thinking the first two were from the vendor...Excellent stone, luscious color and GREAT photo skills. Wow, did you do your homework or what?? Your soon to be fiance will be stunned! Thanks! I don't have a setting in mind yet - was so focused on getting the right stone that I haven't thought much about the setting. Open to ideas of what you think would look nice! Looking for something classic and elegant - leaning away from the halo and more toward a solitaire or pave I think. Oh, I did many hours of homework on this. I ordered several sapphires from other vendors to compare and this one was the winner by far. Granted, this was one of the priciest sapphires available from Gemfix ($7k), but I think the price was justifiable given the amazing color and decent size. mellowyellowgirl and suzanne2 like this. It would be great to start a separate thread to find a setting. Quite some PSers are really knowledgeable on settings for a specific budget. Oh, I did many hours of homework on this. You did, and it shows. Really, really nice stone. I like that your instincts are steering you towards classic elegance on the setting. Take advantage of the collective knowledge here on PS and start a setting thread. It would be interesting if a cutter chimes in, but I think it is because of pleochroism of tourmalines. They do look different from different optical axes. Now I don’t know that much about Asher cuts, but I assume that with windmills and all, the angles are pretty high, so what you are usually seeing is another color because the edges are already another optic axis. It is not a random element, it is just pleochroism phenomenon. Potentially it can be interesting, a cut revealing optical properties of the stone. A very silky color shifting sapphire from Mastercut Gems. And a medium/dark pink spinel from Coast to Coast Rarestone. The sapphire rarely shows its deeper red now that it's set, unless it's candlelight or very warm incandescent. It looses all red and pink under florescent light. I was so close to sending it off to be heated to remove the heavy silk, but changed my mind as I was buying a shipping label. I still consider treating it, but should appreciate it as a natural and unique piece. My spinel pictures are slightly warmer than it is in real life. It is extremely sparkly, and closer to the color of the 1980s astronaut Barbie costume , or a magenta sequin. Seaglow, suzanne2 and lovedogs like this. @MissSarah Dana's pictures have the least amount of "fluff" it seems, and I've found them to be true representations. Almost every other vendor uses some crazy lighting I can't replicate, and I have a hard time remembering that when I see a stunning stone online. Your stones are pretty! I love a good spinel. Do you have a side/profile shot of the ring? Thank you! Spinel is a cool stone; the ones I see on here are mind blowing. I agree completely about Mastercut Gems. I love Dana's honesty in pictures and descriptions of his stones. I feel that he's very trustworthy, and has such a depth of knowledge regarding the traits and provenance of his items. I think the color of this sapphire ended up even prettier than he described it. It reminds me of grapefruit. Here's the ring from the side. Hivona, suzanne2, voce and 4 others like this. Oooh! It looks so pretty in that setting! 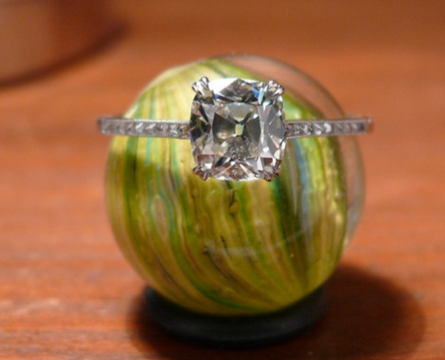 Sometimes it's fun to look at a ring from an angle, so I can see all of the beauty. The colors in your ring compliment one another.